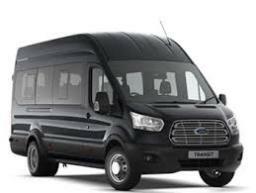 HALIFAX MINIBUS HIRE Welcome to H & H Halifax Minibus Hire with a professional driver. If you need to hire a taxi minibus then give us a call. We offer 6 seater, 8 seater, 10 seater1 12 seater, 14 seater and 16 seater minibuses for hire to cater for all your special events including airport transfers, stag / hen parties, business events, social events, weddings and much more. We provide minibus hire in Halifax and surrounding areas including Hebden Bridge, Sowerby Bridge and Barkisland. Testimonials are curated by H & H HALIFAX MINIBUS HIRE and are not independently reviewed or verified. "Booked a minibus with H & H and received a great service. The driver called before to confirm details, and arrived 10 minutes early on the day. Everything went smoothly and the driver was great. Will use again." "hired a minibus from Salvation in Halifax to York Races. Everything went great, the driver was on time and picked us up at the location we wanted. Very friendly driver and our day at the races was great fun. Thanks."